Glenrowan is a rural locality and township on the route between Melbourne and Albury. It is 184 km north-east of Melbourne and 14 km before Wangaratta. Motorists on the old Hume Highway and train travellers pass through the township, but the Hume Freeway bypasses it (1988). Glenrowan was named after pioneer pastoralists James and George Rowan who occupied pastoral stations between 1846 and 1858 in the area between Winton and Glenrowan. North of the township are the Warby Ranges, which provide run-off for some agricultural pursuits and for the filling of Lake Mokoan east of Glenrowan. The lake, artificially formed in 1970, was formerly several swamps. Its shallowness caused heavy evaporation, and its return to a wetland began in 2009. 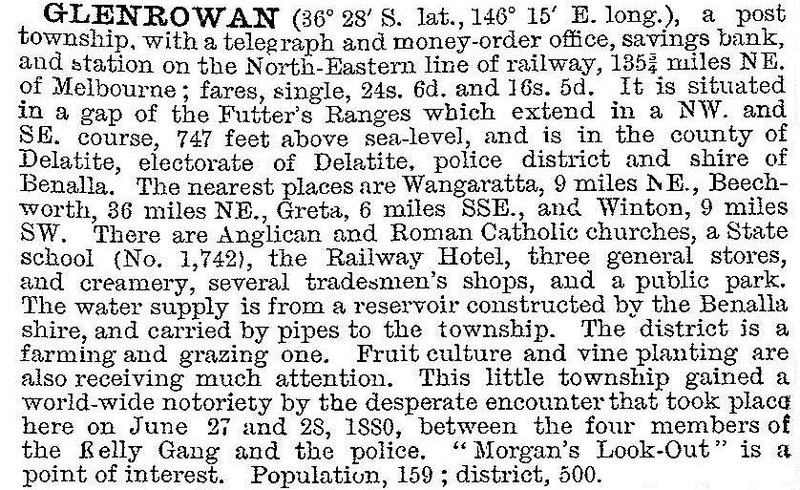 The railway line through Glenrowan was opened in 1873, two years before town allotments were put up for sale and three years before the primary school was opened. In 1880 Glenrowan was the site of the siege of the Kelly gang at Jones Hotel. The gang's leader, Ned Kelly, had calculated that police would be sent to the area by train, because of a recent murder, but the school teacher escaped from Jones Hotel and signalled the train to stop before it came to the part of the railway line which had been torn up so as to wreck it. In the siege which followed, three of the four gang members were killed and Ned Kelly was captured and brought to trial. Glenrowan thus acquired the reputation of being part of the Kelly Country, and has since opened two museums devoted to that subject along with a tourist centre. The siege site (Church, Burns, Hill Streets and Beaconsfield Parade) is a registered heritage precinct. At the foot of the Warby Ranges at Taminick, Bailey's and Booth's vineyards were established before the twentieth century, along with some fruit orchards. Bailey's became renowned for fortified wines, particularly muscat, and Booths for high-baume red table wines. Glenrowan is situated beween forested ranges: Warby Ranges and Mount Glenrowan to the north and a forested range to the south. The road and railway line curve northwards between the ranges, and the town's new settlement has followed the northwards curve. The new settlement is Hamilton Park, and contains several water storages. The original township near the railway station has the school (107 pupils, 2014), a recreation reserve and shops with the tourist attractions. Cafes and food preparation were the largest employment sector (2011 census).